Good news for us social media fans. 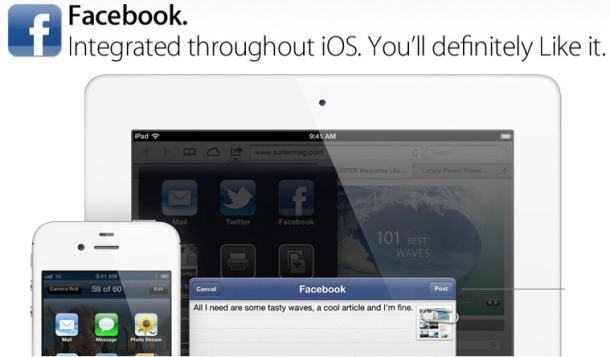 With the new iPhone and iOS 6 platform – we will see Facebook integration built right into the phones software. This means you will just have to log into Facebook once and then you can share directly from your phones camera, map etc to your Facebook account. This will no doubt spur usage for iOS users, similar to how the Apple/ Twitter integration did. It’s important to note the integration won’t automatically share anything – it’s still up to the user to do that. In the new iOS 6 update we will also see Google Maps replaced by Apple’s newly built mapping software – which has built in turn by turn navigation. This will surely be Apple’s biggest software update to date.